Bromo-DragonFLY (or 3C-Bromo-Dragonfly, DOB-Dragonfly) is a psychedelic drug related to the phenethylamine family. Bromo-DragonFLY is considered a potent hallucinogen, having around one third the potency of LSD with a normal dose in the region of 200 μg to 800 μg, and it has an extremely long duration of action, up to several days. Bromo-DragonFLY has a stereocenter and (R)-(−)-bromo-DragonFLY is the more active stereoisomer. Bromo-DragonFLY was first synthesized by Matthew Parker in the laboratory of David E. Nichols in 1998. As with the earlier and less potent dihydrofuran series of compounds nicknamed FLY, Bromo-DragonFLY was named after its superficial structural resemblance to a dragonfly. The hallucinogenic effect of bromo-DragonFLY is mediated by its agonist activity at the 5-HT2A serotonin receptor. Bromo-DragonFLY also has a high binding affinity for the 5-HT2B and 5-HT2C serotonin receptors, and is most accurately described as a non-subtype selective 5-HT2 agonist, as it is actually twice as potent an agonist for 5-HT2C receptors as for 5-HT2A, as well as being less than 5x selective for 5-HT2A over 5-HT2B. Bromo-DragonFLY is also a MAO-A inhibitor, and thus strongly inhibits oxidative deamination of 5-HT, increasing its risk profile. The typical dose of Bromo-DragonFLY is not known, however it has varied from 500 μg to 1 mg. It has about 300 times the potency of mescaline, or 1/3 the potency of LSD. It has been sold in the form of blotters, similar to the distribution method of LSD, which has led to confusion, and reports of mistakenly consuming Bromo-DragonFly. It has a much longer duration of action than LSD and can last for up to 2–3 days following a single large dose, with a slow onset of action that can take up to 6 hours before the effects are felt. 4BDF powder. The pink color is most likely due to an impurity. The color of pure BDF is usually white to off-white, similar to most recreational drugs, so there is no way to distinguish between them by eye. The toxicity of Bromo-DragonFLY appears to be fairly high for humans when taken in doses significantly above the therapeutic range, with reports of at least five deaths believed to have resulted from Bromo-DragonFLY reported in Norway, Sweden, Denmark, Finland and the United States. Laboratory testing has confirmed that in October 2009, a batch of Bromo-Dragonfly was distributed, mislabeled as the related compound 2C-B-FLY, which is around 20x less potent than BDF by weight. This mistake is believed to have contributed to several lethal overdoses and additional hospitalizations. The batch implicated in these deaths also contained significant synthesis impurities, which may have contributed to the toxicity. Vasoconstrictive action resulting from severe overdose of Bromo-DragonFLY is known to have caused tissue necrosis of the extremities in at least one case. In September 2007, a 35-year-old Swedish male required amputation of the front part of his feet and several fingers on one hand after taking a massive (but unknown) overdose; reportedly, the compound acted as a long-acting efficacious vasoconstrictor, leading to necrosis and gangrene which became apparent several weeks after the overdose occurred. Treatment was of limited efficacy in this case, although tolazoline is reportedly an effective treatment where available. Overdose-associated disturbing experiences and health problems have been described. One case in 2008 in England involved inhalation of vomit, causing nearly fatal asphyxia. Seizures have also been reported. On May 7, 2011, in the United States, two young adults died after overdosing on Bromo-DragonFLY, which they thought was 2C-E, and several others were hospitalized during the same incident. Because they took a dosage appropriate for 2C-E, those who took the drug received, in some cases, 100x the normal dose. Both deaths followed seizures, vomiting blood, and terrifying hallucinations. Several surviving victims are reportedly still suffering from its physical effects. Bromo-DragonFLY is listed as a Schedule I in Oklahoma. Schedule III as of Oct 12 2016. "2C-phenethylamines and their salts, derivatives, isomers and salts of derivatives and isomers that correspond" to a broad definition that includes anything with a 2,5-dimethoxyphenylethamine core. This includes most 2C-s, DOx, TMA, Aleph, NBOMes, NBOHs, NBF, bk-2-C-B, 2C-B-Fly, Bromo-DragonFLY, etc. See http://www.gazette.gc.ca/rp-pr/p2/2016/2016-05-04/html/sor-dors73-eng.php. Bromo-DragonFLY is widely reported by the media as being a class A drug. However, as of 2014, it remains unclear to what extent it is covered by the UK phenylethylamine catch-all clause, with commentators noting both the structural similarities and differences to the phenylethylamine class. If the prosecution could demonstrate structural similarity in court, it would be considered a Class A substance but as a benzodifuran it is significantly different to this class. It is not explicitly named in the misuse of drugs act. It would be covered by the UK Psychoactive Substances Act 2016. Sveriges riksdag added Bromo-Dragonfly to schedule IV ("substances, plant materials and fungi with medical use") as narcotics in Sweden as of Jan 3, 2008, published by Medical Products Agency in their regulation LVFS 2007:14 listed as Bromo-Dragonfly, brombensodifuranyl-isopropylamin. Bromo-DragonFLY was first classified as "health hazard" by Sveriges riksdags health ministry Statens folkhälsoinstitut [sv] under the act Lagen om förbud mot vissa hälsofarliga varor [sv] (translated Act on the Prohibition of Certain Goods Dangerous to Health) as of Jul 15, 2007, in their regulation SFS 2007:600 listed as brombensodifuranylisopropylamin (Bromo-Dragonfly), making it illegal to sell or possess. On December 3, 2007 the drug was banned in Denmark. The substance has been declared illegal by health minister Jakob Axel Nielsen, following recommendations from the Danish Health Ministry. It is currently classified as a dangerous narcotic and therefore its possession, manufacture, importation, supply or usage is strictly prohibited. Anyone involved in such activities can face legal action. Bromo-DragonFLY is currently on the Norwegian narcotics list,. Thus it is effectively a narcotic drug by Norwegian law. Currently, Bromo-DragonFLY is an uncontrolled substance in Poland. The chemical compound has been added as an illegal substance under the Law 143/2000 on February 10, 2010. As of 9 September 2011, Bromo-DragonFLY was added to Schedule 2 of the Queensland Drugs Misuse Regulation 1987. Nationally, the drug is listed under Schedule 9 (Prohibited) of the Poisons Standard. Accordingly, the drug is prohibited in all states and territories. 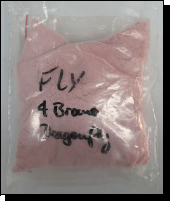 As of 12 March 2012, Bromo-DragonFLY is an illegal designer drug. ^ "Bromo-DragonFLY". Forendex. USA: Southern Association of Forensic Scientists. Archived from the original on 6 October 2014. Retrieved 16 March 2012. ^ "Erowid Bromo-Dragonfly Vault". www.erowid.org. Archived from the original on 23 March 2018. Retrieved 26 March 2018. ^ a b c "Erowid Bromo-DragonFly Vault : Dosage". Archived from the original on 2008-03-22. ^ Parker MA, Marona-Lewicka D, Lucaites VL, Nelson DL, Nichols DE (December 1998). "A novel (benzodifuranyl)aminoalkane with extremely potent activity at the 5-HT2A receptor". Journal of Medicinal Chemistry. 41 (26): 5148–9. doi:10.1021/jm9803525. PMID 9857084. ^ Noble C, Holm NB, Mardal M, Linnet K (1 October 2018). "Bromo-dragonfly, a psychoactive benzodifuran, is resistant to hepatic metabolism and potently inhibits monoamine oxidase A". Toxicology Letters. 295: 397–407. doi:10.1016/j.toxlet.2018.07.018. PMID 30036687. ^ "Erowid Bromo-Dragonfly Vault : Reported GHB-Related Death Involved Bromo-Dragonfly". Archived from the original on 2008-03-12. ^ "Erowid Bromo-Dragonfly Vault : Information about a death reportedly related to Bromo-Dragonfly". Archived from the original on 2007-12-04. ^ Kajsa Hallberg (2007-04-03). "Man i 20-årsåldern dog av drogen Dragonfly". expressen.se (in Swedish). AB Kvällstidningen Expressen. Archived from the original on 2011-10-20. Retrieved 2009-10-30. ^ Ritzau (2008-08-24). "Nyt stof har slået dansker ihjel". jp.dk (in Danish). Archived from the original on 2008-09-12. Retrieved 2009-10-30. ^ Andreasen MF; Telving R; Birkler RI; Schumacher B; Johannsen M. (January 2009). "A fatal poisoning involving Bromo-Dragonfly". Forensic Science International. 183 (1–3): 91–6. doi:10.1016/j.forsciint.2008.11.001. PMID 19091499. ^ Siukonen, Timo (2012-12-14). "Kassisurman päätekijälle 11,5 vuoden vankeustuomio taposta". Helsingin Sanomat (in Finnish). Retrieved 2012-12-14. ^ "Erowid 2C-B-Fly Vault: Death Report". Archived from the original on 2009-10-13. ^ George, Sallie (2008-03-27). "England | Surrey | 'I nearly died from taking £5 hit'". BBC News. Archived from the original on 2012-04-23. Retrieved 2010-02-08. ^ Wood DM, Looker JJ, Shaikh L, Button J, Puchnarewicz M, Davies S, Lidder S, Ramsey J, Holt DW, Dargan PI (December 2009). "Delayed onset of seizures and toxicity associated with recreational use of Bromo-dragonFLY". Journal of Medical Toxicology. 5 (4): 226–9. doi:10.1007/bf03178273. PMC 3550403. PMID 19876858. ^ "| Danish man died after trip on Chinese drug". Jp.dk. Archived from the original on 2012-04-23. Retrieved 2010-02-08. ^ "Second Victim Dies After Taking Designer Drug In Konawa". newson6.com. Archived from the original on 27 March 2018. Retrieved 26 March 2018. ^ George, Sallie (2008-03-27). "'I nearly died from taking £5 hit'". BBC News. BBC. Archived from the original on 2012-04-23. Retrieved 2013-11-28. ^ Psychonaut Webmapping Research Group. "Bromo-Dragonfly Report" (PDF). www.psychonautproject.eu/. Institute of Psychiatry, London. Archived (PDF) from the original on 15 May 2012. Retrieved 12 June 2014. ^ "Ask Erowid : ID 3103 : Does Bromo-Dragonfly fall under the UK ban on phenethylamines?". www.erowid.org. Archived from the original on 24 March 2018. Retrieved 26 March 2018. ^ Advisory Council on the Misuse of Drugs. "Consideration of the Novel Psychoactive Substances ('Legal Highs')" (PDF). UK Home Office. Archived (PDF) from the original on 14 July 2014. Retrieved 12 June 2014. ^ UK Home Office. "UK Misuse of Drugs Act 1971 > 1971 c. 38 > SCHEDULE 2". Archived from the original on 2012-12-29. Retrieved 2013-11-28. ^ "Amendment of Executive Order on Euphoriant Substances". Danish Medicines Agency. 2007. Archived from the original on 2012-04-23. ^ "Erowid Bromo-Dragonfly Vault : Legal Status". Archived from the original on 2008-04-15. ^ "List of narcotic drugs according to Norwegian law". Archived from the original on 2012-04-23. ^ "Statens Legemiddelverk about derivates and Bromo-DragonFLY". Archived from the original on 2009-05-28. ^ "Modified Romanian law 143/2000 on January 10, 2010". Archived from the original on June 24, 2010. Retrieved February 28, 2010. ^ "Queensland Drugs Misuse Regulation 1987" (PDF). Archived (PDF) from the original on 2011-04-22.